This 1966 35mm. 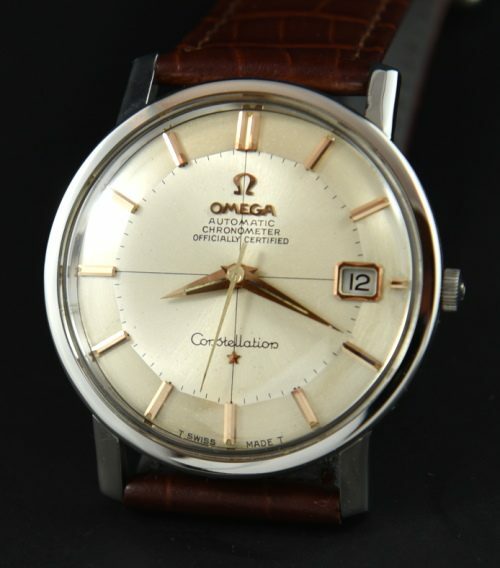 OMEGA CONSTELLATION Pie-Pan measures 35mm. and looks larger due to the narrow bezel. Look at this amazing and all original quadrant pie-pan dial with Dauphine (original) hands-WOW! The stainless case gleams with crisp observatory logo. The fine automatic chronometer grade caliber 561 movement was just cleaned and is accurate. The correct and expensive OMEGA hesalite crystal is installed. It’s all about the dial!